We are looking for volunteers to take over Movies in the Park beginning next year. Please contact Meg Ritter at 303-665-0351 or email meg@rpmhoa.com for details. What's the Holiday Neighborhood Eco Pass? The Holiday Neighborhood Eco Pass is available only to residents of the Holiday Neighborhood. As a resident, your Holiday Neighborhood Eco Pass is paid for by your monthly fee to the Holiday Master HOA (or is included in your rental fee, in case you are renting in Holiday). 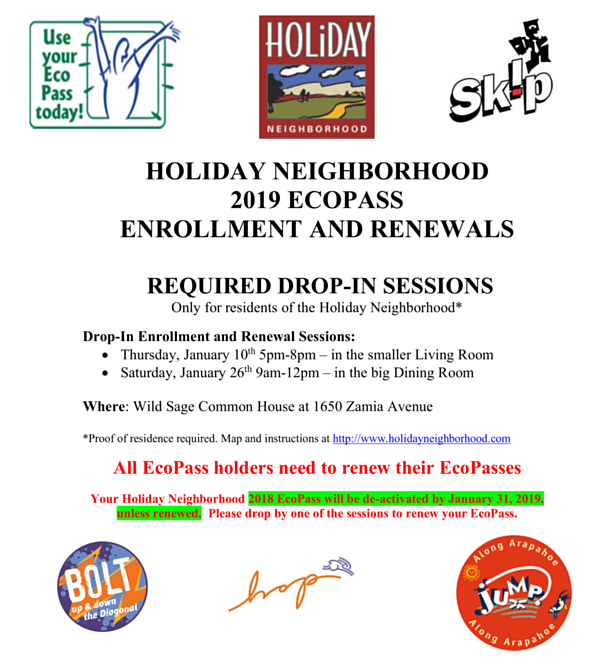 To get a new Holiday Neighborhood Eco Pass or to renew your existing pass for the new year, go to one of the end-of-year official Holiday Eco Pass handout/renewal sessions as advertised through fliers and door hangers in the neighborhood and through the annual Holiday Master HOA mail out. During the year, send email to holidayecopass@comcast.net to get automated response with latest instructions on where, when and how to get help with your Holiday Neighborhood Eco Pass needs.